Many consider the Central Boiler Wood Burning Furnaces the best of the best. That's why we have sold hundreds of these highly-rated furnaces. Our customers like to brag about how much money they save on their heating bills. They love how their furnace performs. 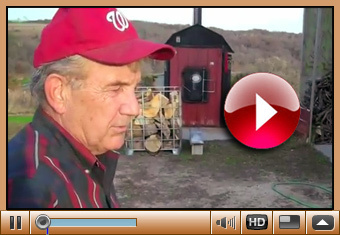 Listen to Jack Potter of Dodgeville, WI as he talks about his system. An outdoor wood burning boiler is an excellent alternative heating system. Whether you want to heat your home and eliminate your gas or fuel oil bills or if you're tired of working in that cold shop or garage, an outdoor wood burning boiler is likely the solution you’ve been looking for. Along with being environmentally friendly outdoor units offer an efficient, cost-effective way to heat your home, business, workshop or barn. Listen as the owner of CSI, George Breiwa, talks about the Classic and E-Classic Central Boilers. The E-Classic models are EPA Phase 2 compliant and boast an efficiency rating of 92%! Mr. Breiwa only carries products that customers will be satisfied with and Central Boiler's always deliver great results for them. Wood is not only the oldest fuel source; it is a sustainable, renewable resource. It’s low environmental impact and ready available in our area of northwest Illinois, southwest Wisconsin and northwest Iowa. Our wood burning boilers and furnaces are designed to burn clean with have low emissions. Wood heating systems offer independence from oil and gas suppliers. Let's all save money by going green... let's all burn wood! However you are heating now: forced-air, radiant or hydronic, an outdoor wood burning boiler can be connected to your existing system. The boiler furnace can be installed outside, from 15 to 500 feet from your home or shop. Water that surrounds a firebox is heated with wood. A pump moves the heated water via an insulated supply line, to the house. In a typical forced air system, a water to air heat exchanger is mounted in the plenum of the furnace. A second thermostat is added that controls the furnace's blower fan. When this thermostat starts calling for heat, the thermostat cycles the fan on and air is blown through the heat exchanger. The warm air is moved through the house via the ductwork. When the thermostat is satisfied, the fan on the furnace will cycle off. The conventional thermostat is turned down and as long as the house remains above that temp, no gas or oil will be used. Depending on the complexity of a radiant heating system, the hot water is sent to a manifold where zone valves tied to thermostats will control how many and which loops are cycled on and off. For an existing gas or oil boiler system, one of two connections can be used. A water to water heater exchanger will transfer the heat from the wood system to the gas or oil system. The second alternative is to relieve the pressure on the inside system and tie the outdoor wood system water directly to the indoor system hot water. The water being heated by an outdoor wood system is not potable. That is, it's not used for cooking, bathing, laundry, etc. But the domestic water can be heated by the outdoor wood system with a water to water, side-arm heat exchanger. A tempering valve is used to lower the water temperature to safe levels. Swimming pools and hot tubs are also popular applications for an outdoor wood boiler. When choosing an outdoor wood burning boiler you can choose either a traditional or high efficiency model. Traditional wood boilers transfer the fire’s heat directly to the water through the firebox walls. This is an effective way to heat the water, but it prevents the fire from burning at the most optimal temperatures. As a result, the fire does not burn as efficiently. High efficiency wood boilers use a gasification process that results in considerably fewer emissions and higher efficiencies. A secondary burn chamber allows the fire to reach extremely high temperatures that cause it to burn nearly all of the ashes, gasses and smoke from the fire. Emissions are greatly reduced and efficiencies often exceed 90%. come into our showrooms in Highland, Wisconsin. We can help you determine the best option for you. We are an authorized dealer for Central Boiler Wood Burning Boilers, and PSG forced air wood burning furnaces.